Do you want to rest but at the same time visit really fascinating locations and explore interesting places? Spending your holidays sailing along Italian coastoffers a unique opportunity to visit every day a new and attractive location - either a historical Mediterranean town or an exotic island with hidden beaches and inspiring nature and all that within the reasonable price. In the meantime you can enjoy a variety of culinary attractions, swimming and diving in extremely clean sea or simply sunbathing. Also, comparing a hotel accommodation prices in one of the Italian resorts with yacht charter along the Italian coast in the high season would lead you to the conclusion that not only sailing is affordable, but it is even more convenient! For example- approximate half board price in a four star hotel accommodation for six people amounts 3000-3500 Euro per week and sailing boat price for six people amounts 2200-2600 Euro. 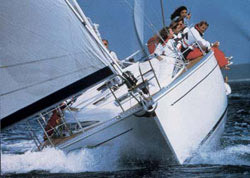 Sailing boats spend 80-100 Euro of fuel per week and smaller motor boats spend around 300-500 Euro of fuel per week. Not to mention incomparable advantage of number of seen and visited places which, when being visited from your hotel base, would cost you a lot of extra money and take much more time that you could certainly spend with more pleasure instead!